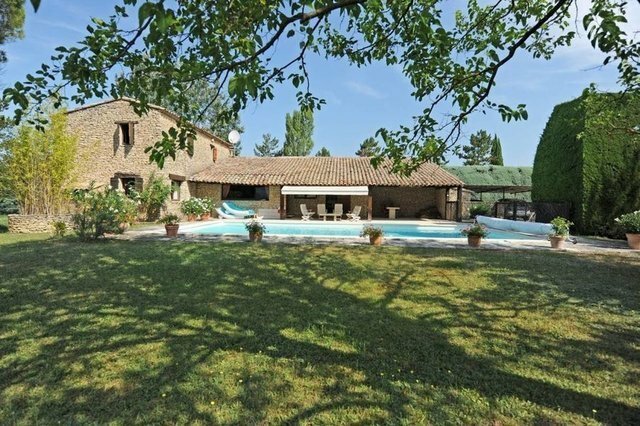 Close to Gordes, great family property with guest house, tennis and swimming pool, built in the late 70's.The main stone house offers superb volumes, as the main living room opened to the West on a small reading room then an office (separated by a nice fireplace). On the East side a fitted kitchen accesses directly to the south on the paved terrace and its large awning used as a summer dining room. A back kitchen / laundry room and a small shed. At the back, a hall with visitor toilet leads to bedroom I with its bathroom. The bedroom II and its bathroom have direct access to the garden.Upstairs, bedrooms III and IV share a bathroom.A few meters to the side is the stone guest house, composed of a beautiful living room with kitchenette, rooms V and VI sharing a bathroom with toilet.The 6 x 12 meter concrete pool is located in front of the house, surrounded by stone pavements and a lawned and landscaped part with automatic watering (well - 150 m). The tennis court in quick is at the end of the property.The land with a total area of nearly 3 hectares is fairly well distributed around the buildings, and includes a sophisticated garden and a more agricultural part entrusted to a local farmer. The views are unobstructed and impregnable, from the Monts de Vaucluse to Gordes, Goult and the Luberon Mountain.